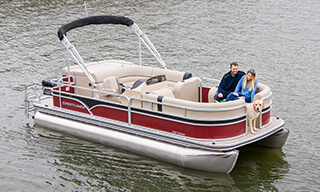 Our all-new Crestliner Chase pontoon boats deliver on-the-water versatility at a reasonable price. 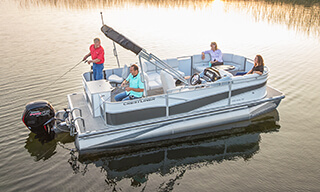 It features multiple layouts and three lengths which gives you a variety of options to choose from to find the right boat for your interests. 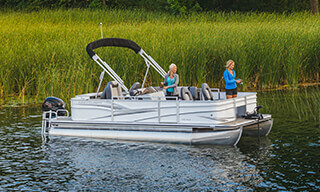 Each new pontoon boat comes fully stocked with features. From the helm station that includes lit toggle switches, multiple gauges, a 12V outlet, and storage to the comfortable lounge furniture, you’ll have everything you need wrapped up in a relaxing package. 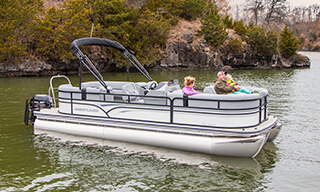 The Chase pontoon series allows you to choose from 18, 20, or 22 foot options as well as Cruise (CS) or a Center Walk-Through Dual Helm (CWDH) option. No matter what you choose, there will be plenty of space for everyone you want to bring on board. 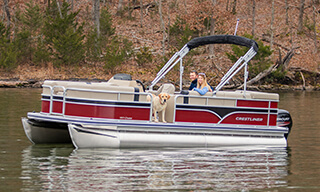 And with Crestliner’s reinforced tube construction to deliver unmatched durability, you’ll have a boat that you can make memories with year after year. 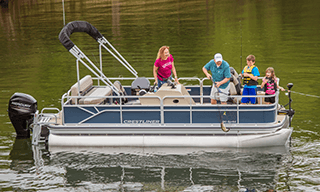 With the option to add the V3 Action Package and a ski tow bar, the Chase will excel at any water-based interest you have. It’s time to hit the water and see for yourself. Spacious bow furniture and L-lounge furniture with a table are perfect for entertaining large groups. The large sunpad on the back includes ample storage space and room for an optional changing room. The helm station comes equipped with a comfortable chair so no matter where you sit, the riding is always easy. Convenient walkthrough layout allows for easy movement throughout the deck. Two comfortable helm seats provide versatility and comfort. Two chaise lounges in the front and two lounges in the back are ideal for lounging or entertaining large groups. Comes with a removable table with cupholders.